Air Castle is a great quilt block because of the way the design circles around the center of the block. This design, with its triangular pieces, is an ideal one to show a technique very common in needlepoint, but not often called by its name — diaper patterns. A diaper pattern is any pattern, in stitching or otherwise, which has a regular repeat in all directions — vertically, horizontally and diagonally. Diaper patterns can be extremely complex or very simple; these are simple ones. And yes, the word for baby’s diapers does come from the word for these patterns. The fabric used for diapers was often woven in a diaper pattern called bird’s eye. The article made from this cloth came to be called the name for the type of pattern. You’ll find this block next to the Dolley Madison Star, completing that row. Many textured stitches that are used in needlepoint are diaper patterns naturally. One easy way to create a diaper pattern is to do something like a Scotch Stitch but alternate the stitches in two different colors or threads. And there it is — a diaper pattern which has a regular repeat in all directions. This particular diaper pattern is used in the center square and in the central triangles on each side. Another easy way to make a diaper pattern is to do an area in all Tent Stitches with small motifs repeated regularly. This kind of diaper is used in the other two patterns in the block. A pattern where motifs are repeated this way is one of the most common types of diaper patterns, it is often seen in fabrics and in wallpaper. They can be recognized easily because the motif runs in vertical rows (the vertical repeat) but horizontally each vertical row is offset 1/2 pattern from the ones beside it. These are called “half-drop” patterns because the pattern is moved half a row when repeated. Doing this sets up the diagonal repeat because the motifs now move in diagonal rows as well as vertical ones. The horizontal repeats are two motifs wide, covering both kinds of vertical rows. There are all kinds of other transformations which can change patterns and often these will result in diaper patterns. To see if any pattern is a diaper, look for the repeats in all directions. The master chart for the block is below. It shows each of the four patterns used in the patch in one part of the design. The individual patterns are also charted and explained in the post. Begin by stitching the four outer corners of the pattern, which are done in the gray Impressions. This gives a nice solid area for starting and stopping your stitches. 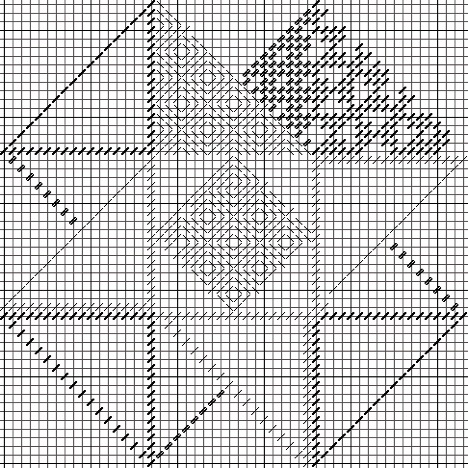 The four corner triangles are stitches using Felicity’s Garden (thick lines) and Silk Serica (thin lines) in the pattern diagrammed below. The Silk Serica makes a little four stitch motif (kind of like a “t”) which rotates around a center. Because this is an overall pattern, the placement of the first motif does not have to be exactly the same. However, make all four triangles match as they are stitched. In order to do this, rotate the chart below so that it matches the orientation of each of the corners; this chart is for the bottom right corner. Once these triangles are stitched, move on to the other four large triangles on the outside. The same pattern is also used for the central diamond. These patches are done in Silk Serica and Madras. They are done entirely in Scotch Stitch, alternating the thread used as well as the slant of the stitch. The diagram of the complete block above shows one triangle and the center block in this pattern. The individual diagrams for this pattern are below. Begin with a complete stitch in Madras in the right angle of each triangle. Then work your way across the rows, alternating threads. You will end up with a row of half Scotch Stitches in Silk Serica running along the long side of the triangle, opposite the right angle. In the center diamond (diagrammed above), two half Scotch Stitches should touch the center point of the triangular patches. The diagram of this area shows some of the triangles on all sides for orientation. After the Alternating Scotch Stitches are completed, fill in the rest of the area with Tent Stitch in Impressions. The final area to stitch is the small triangles around the sides of the pattern. These are stitched in Cresta d’Oro and a single strand of Watercolours. Be sure to stitch the areas in Watercolours using the Continental Stitch instead of Basketweave. Using Continental when stitching with an overdyed thread gives vertical or horizontal stripes instead of the less appealing diagonal stripes of Basketweave. Add the single stitches in the metallic to these patches and finish by filling in the background with Impressions. Remember to rotate the chart above to show the orientation for each of the four patches. This one is my favorite so far, but I am itching to get started on all the stitches.